Do you ever pause for a moment and ask yourself how you arrived at a particular moment, a particular situation? I had a few of those moments as I looked at this table Saturday morning. 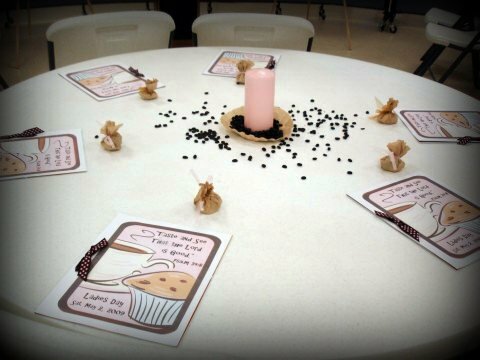 This table happened to be located in the Smithville Church of Christ fellowship building. There were several other tables just like this one dotted around the room, on each of them were programs for their Ladies' Day, which was scheduled to begin in just a few minutes. 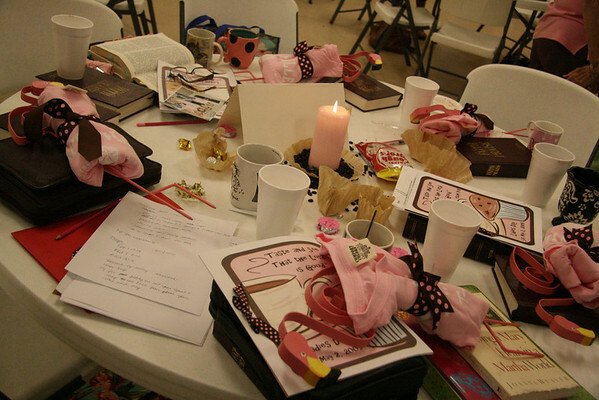 The theme was based around Psalm 34:8 "Taste and see that the Lord is good...", coffee and friendship. These wonderful ladies worked themselves silly decorating, organizing and preparing down to the last coffee bean placed around the candle centerpieces. Meet (from the left) Becky, Tawana and Lynn. Aren't they cute? YES!! Apparently once they get an idea, well...there's just no stopping them. 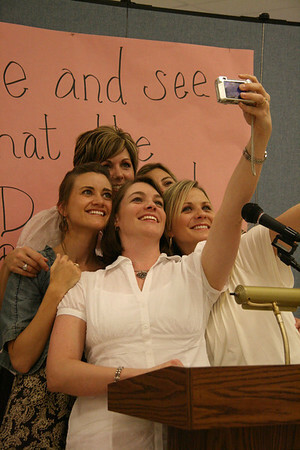 See, about a year ago Lynn (who is my sweet friend Heather's mama) got an idea about our little group of girlfriends speaking at a Ladies' Day at their church. It didn't matter that we had never dreamed of doing something like that, nor that we didn't really have experience. They asked us and we were honored to oblige. Before you could spit, there we were...about to speak to the assembled ladies from their church. Gulp. After much Bible study, prayer and preparation, Heather, Kim, Robyn, Lacie and I were ready. At least I think I was...more on that in a minute. 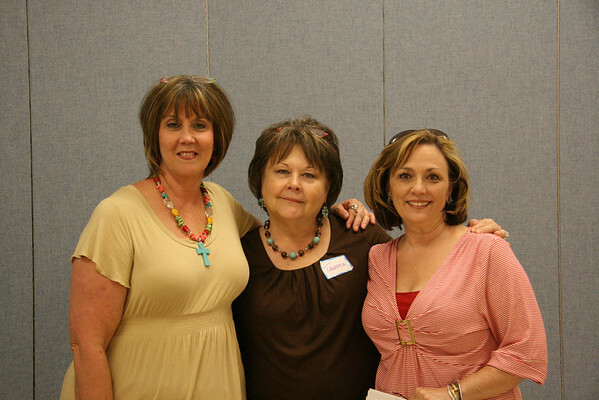 Lynn, Tawana and Becky posted scrapbook pages about each of us so the ladies would know a few more snippets about our lives and families. 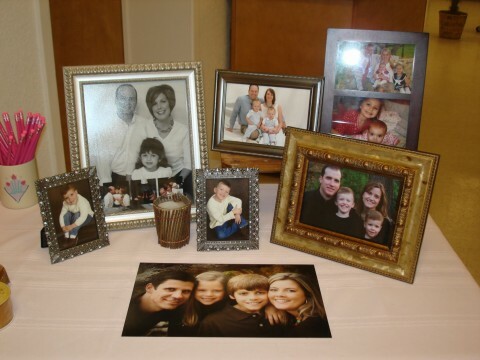 We set out family photos at the registration table so they could see a little bit more about who we are and where we came from. You know, that we were fairly normal and all. 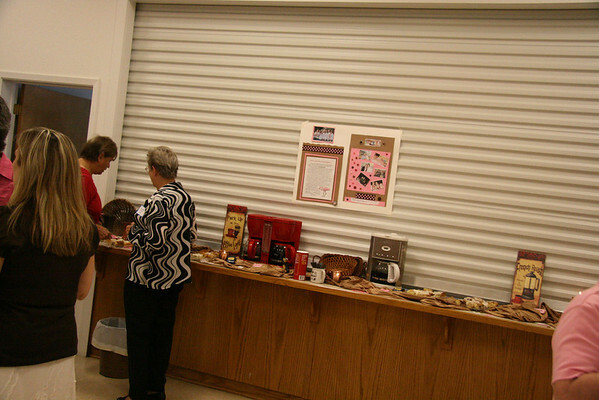 They also set up a fabulous coffee bar to keep us energized. Along with the coffee that morning, there were the most amazing homemade cinnamon rolls as a treat. The sweet lady who made them shared her magic ingredient, egg nog--who knew? They melted in your mouth and were absolutely sinful er... delicious. Later that afternoon we enjoyed a buffet of tasty salads and desserts, except I couldn't really enjoy them too much since I hadn't had my turn to speak yet. Yikes! 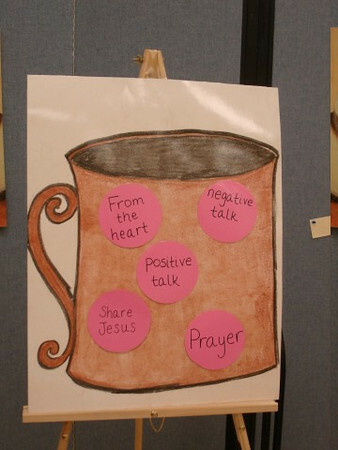 We each prepared a lesson to share, each relating aspects of coffee to our Christian walk. For instance, Lacie spoke about our Chosen Cup, relating how our lives can be plain, fragile clay, but we can be filled and refilled by Jesus and the Holy Spirit; Kim spoke about the taste of coffee and how Christ can quench our thirsts; Heather spoke about incorporating Christ into our routines; Robyn spoke about the types of talk and the importance of talking about Jesus with others; and I wrapped things up sharing about how the different temperatures of coffee (cold/stale, lukewarm, fresh/hot/bold) can relate to our spiritual lives. We had a few visual aids to help with each of our lessons. I didn't get a picture of everything, but here are the coffee cups. 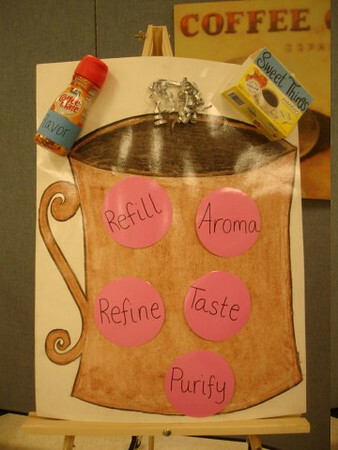 The pink dots represent key points from each lesson, the sweetener and creamer are added to give flavor to our spiritual routines, the silver ribbon represents the steam on a fresh, hot and bold cup of coffee. Sorry if it doesn't make sense in this context. I guess it was one of those things you have to experience real time. 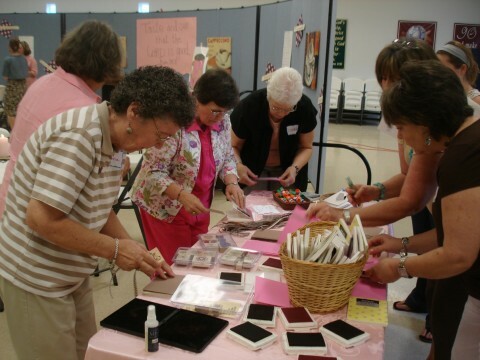 The ladies also had an opportunity to make their own scripture book for a craft. 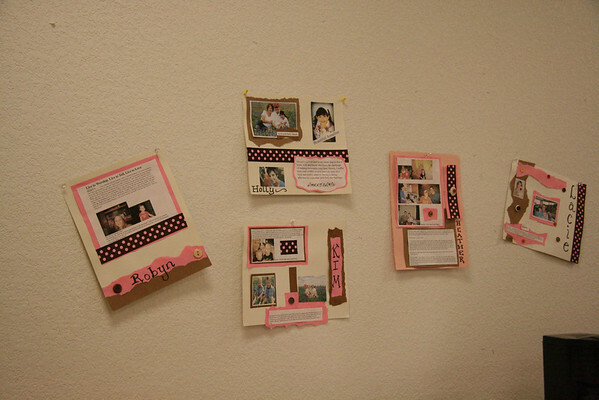 They each stamped and decorated a cover for a blank brag book and filled it with blank index cards. The idea is to write favorite scriptures on each index card then carry them with you, so you can turn to them whenever needed as a spiritual pick me up. 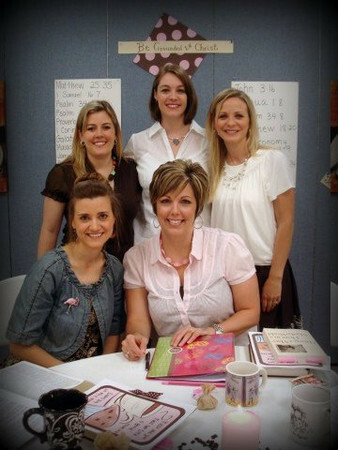 We were pleased as punch to see the ladies piled around the table getting crafty and adding their own flair to their book. Love that! Along with our talks, there was plenty of uplifting singing, prayers, even skits interspersed throughout the day. We mingled and chatted with ladies of all ages, which was fun and very encouraging. Everyone was so welcoming, friendly and happy to be giving a part of their Saturday to God. I know I was blessed by their presence, I hope they took away something that encouraged them as well. Before we left, we posed for a quick self-portrait at the podium. Being a part of their Ladies' Day was absolutely wonderful!! I'm truly thankful for the opportunity to grow in my spiritual life and to challenge myself in new ways to serve. I'm also truly thankful I got to experience it with these special girls and the special ladies of Smithville. Stay tuned...more on the weekend road trip adventure coming soon! OHHHHHHHH I feel like I am there again. It was so amazing and I am still basking in you girls. Your zeal, your freshness and honesty left a mark all over this town. You girls just rocked my world. I love you very MUCH MUCH Miss Holly. oh, i can't wait to hear more! Wow! What a cool idea and an amazing experience for so many ladies. I wish I could have been there to hear y'all! Holly, I know that was a great experience and a memory that your special group of friends will always treasure! Thanks for sharing! I love the coffee analogy- so darling & so catchy-- surely NO one will forget the powerful messages. how wonderful to have such a group of friends & talented, creative & speakers! I love the craft too. wish I could have been there. Oh my gosh, you ROCK! I LOVE IT! So super duper cute. I'm glad you guys had such a good time. I just think that is wonderful. These ladies went above and beyound in their preparation - very creative and so glad you a part of it! Good Job! How fun! Look like you ladies an amazing time! What a cool thing to work on and get to do together as a group. Thanks y'all! Although it was a new experience that was out of my comfort zone (speaking in front of others), I am glad I had the chance to grow and challenge myself a bit more. Who knows, maybe we'll get an opportunity to do this type of ministry again some time. It sounds like everyone was out getting inspired this past weekend! what a great weekend! looks like you did a great job with your ladies weekend! so fun!